The myth persists that convex pillar flutes are very difficult to cut. An experienced glass cutter has remarked that while they are not especially difficult to cut, they nevertheless require a considerable amount of time to produce. Initially the boundary between the intended pillars is cut with the miter wheel. Then its edge, or the edge of a flat wheel, is used to shape the profile of the convex pillar. Pillar cutting, which is sometimes called “lustre cutting,” was popular in the 1820s and 1830s in England and Ireland. As early as the 1830s swirled(sinuous) pillars were cut in England (Hajdamach 1991, pl. 31). This swirled style was used by Dorflinger, Hawkes, Hoare, and others later in the nineteenth century when pillar cutting became popular in this country and was revived in Great Britain. In addition to columnar and sinuous pillars, this type of cutting includes shapes such as tusks and cabochons. Theconcave cutting wheel can also be used to produce pillars when they are of uniform width through-out. Perhaps this is how the pillars on this decanter were cut. 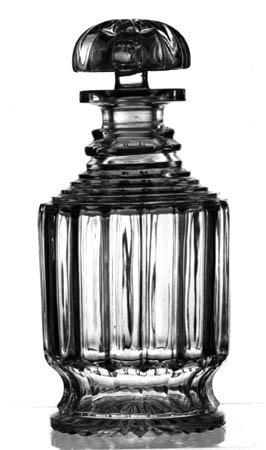 One-pint decanter, lead glass. Pillar cut with original mushroom stopper. Step cutting (prismatic rings) on shoulder and neck. Base cut with ridged radiants. Probably English, c1830. H – 7.5″ (19.0 cm), D – 3.5″ (8.9 cm), wt = 1.5 lb (0.7 kg). Sold for $92 in 1998.